Movies in the Garden is here! 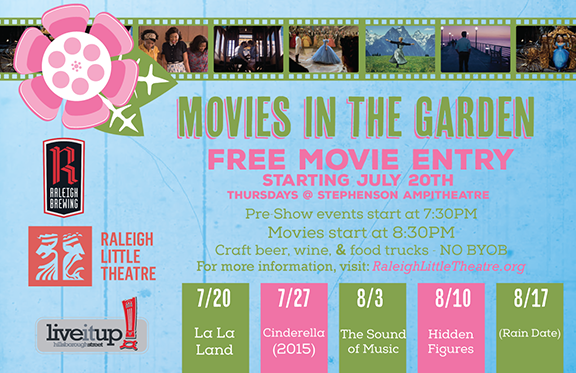 Come to Stephenson Outdoor Amphitheatre adjacent to Raleigh Little Theatre and the Rose Garden to enjoy free movies, great food, and cold adult beverages sponsored by Live It Up! Hillsborough Street, Raleigh Little Theatre, and Raleigh Brewing. Movies start at 8:30 pm, with pre-show activities starting at 7:30 pm and food trucks opening at 7:00 pm. The three remaining days of the series will screen Cinderella, The Sound of Music, and Hidden Figures. Admission is free, and various food trucks, vendors, and concessions (including cold adult beverages provided by Raleigh Brewing) will be available for purchase. There will also be various interactive pre-show activities for all ages! Raleigh Little Theatre and Live it Up! 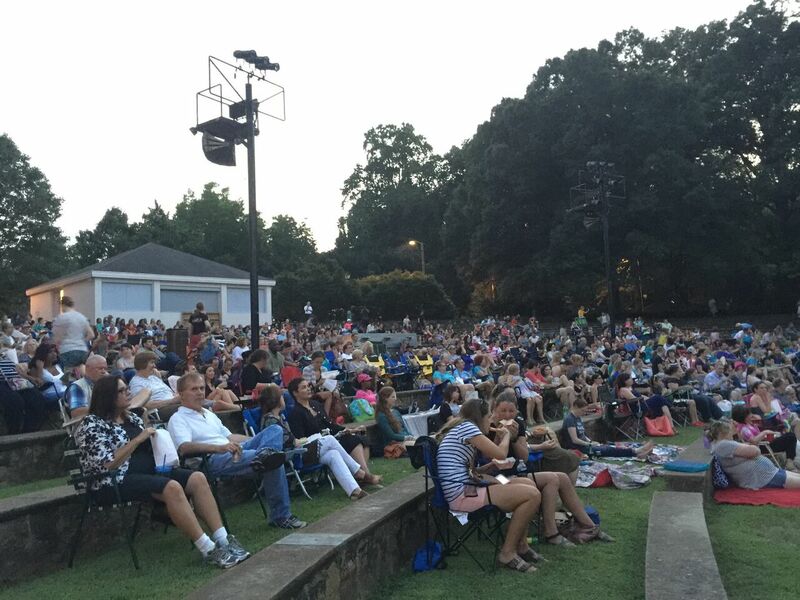 Hillsborough Street hosted an online poll in April, and audiences voted to see The Sound of Music and Hidden Figures, but all movies were selected to be somewhat theatre related and fun for all ages! So come to the Rose Garden and enjoy great food and great movies! The details for each remaining date are below. Follow us on Facebook, Instagram, and Twitter for the most up to date info. All food trucks will start serving at 7:00 pm, pre-show activities will start at 7:30 pm, and the movie will start at 8:30 pm. Pre-show Activities: Disney Trivia Contest - Test your Disney Knowledge! Prizes from Hillsborough Street merchants will be given out. Pre-show Activities: Lip-Synch Battle - hosted by Kristie and Amy from Raleigh Brewing Company, Prizes from Hillsborough Street merchants will be given out. Second Chance Adoptions - Furry friends and potential pets will be brought to the Rose Garden! Pre-show Activities: Raleigh Little Theatre's Crowns - A performance by the cast of RLT's Crowns - a moving and celebratory gospel musical in which hats become a springboard for an exploration of Black history and identity. Are You Smarter Than a Rocket Scientist? - Compete against others to find out if you're smarter than a rocket scientist! Prizes from Hillsborough Street merchants will be given out.